Aseptic packaging is defined as the filling of a commercially sterile product into a sterile container under aseptic conditions and hermetically sealing the containers so that reinfection is prevented. We boil the milk in the container and further keep in the refrigerator. But still the milk becomes spoiled after 2-3 days. After boiling milk, we are ensuring milk commercially sterilized, but still product becomes bad after few days. Reason is that, the milk becomes sterile, but the container is not sealed and the microbes present in the air contaminates the product and spoils them. A mother of 6 month kid, boiled the milk, filled it in a sterilized bottle and kept it closed. But still it gets spoiled in few hours. Reason being, the product was not packed in a sterile condition and pack was not sealed. In aseptic processing, the design to achieve commercial stability is based on the well-founded principles of thermal bacteriology and integrated effect of time/temperature treatment on spores of micro-organisms. Pre-sterilization of a product usually consists of heating the product to the desired UHT temperature, maintaining this temperature for a given period in order to achieve the desired degree of sterility, with subsequent cooling, usually to ambient temperature and sometimes to an elevated temperature to achieve right viscosity for filling. Heating and cooling should be performed as rapidly as possible to achieve the best quality, depending upon the nature of the product. A fast heat exchange rate is desired for cost reasons. Gamma-radiation, due to excellent penetrating powers, is used as sterilant for the bulk packages at commercial irradiators. A dose of approximately 1.5 Megaradians (Mrad) is commonly used to decontaminate containers for acid and acidified food. For proper sterilization of product, time temperature combination is very much required. We need to ensure that each and every particle of the product is exposed to required temperature and for required time. So, after bringing brought to the sterilisation temperature, it flows into a holding tube. The tube provides the required residence time at the sterilisation temperature and also ensure that the fastest moving particle through the holding tube will receive a time/temperature process sufficient for sterilisation. A deaerator is used to remove air to prevent undesirable oxidative reactions, which occur as the product temperature is increased during the process. The deareation is generally carried by keeping product under vacuum. The sterilised product is accumulated in an aseptic surge tank prior to packaging which is further pumped into the surge tank and is removed by maintaining a positive pressure in the tank with sterile air or other sterile gas. Any aseptic system must be capable of closing and/or sealing the package hermetically to maintain sterility during handling and distribution. The integrity of the closure and seal is very important to avoid contamination post packing. Though basic objectives are same, there is fundamental difference between aseptic packaging technology and canning. 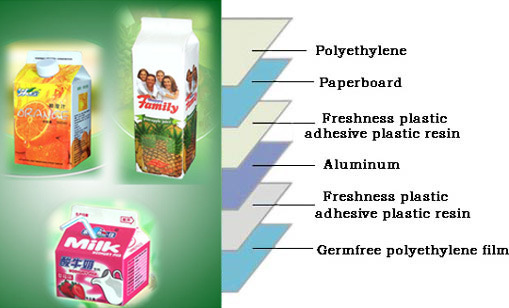 In canning product and packaging is sterilized after sealed packaging of the product. The canning process begins with treating the food prior to filling. Initial operations inactivate enzymes so that these will not degrade the product during processing. The package is cleaned, and the product is introduced into the package, usually hot. Generally, air that can cause oxidative damage is removed from the interior. The package is hermetically sealed and then subjected to heating. The package must be able to withstand heat up to about 100°C for high acid products and up to 127°C for low acid products, which must receive added heat to destroy heat-resistant microbial spores. Packages containing low-acid (above pH 4.5) food must withstand pressure as well. Although conventional canning renders food products commercially sterile, the nutritional contents and the organoleptic properties of the food generally suffer in the processing. Moreover, tinplate containers are heavy in weight, prone to rusting and are of high cost.